Appletesters.net is a web database application allowing apple variety testers including growers, Extension Agents, private nurseries and fruit breeders to collect, manage, and share apple variety characteristic information. Selecting the best apple varieties for planting is the key component to the sustainability of orchard operations. The website www.appletesters.net is up and running. A total of 123 records in the database (individual apple variety evaluations, some from the same variety over different harvest dates) have been entered. More fruit records and cooperators will be identified and contributed in 2010. Presentations on the data base and our apple testing programs were made at both Twilight and winter fruit meetings in New England and New Jersey. The objective to develop a web-based application (appletesters.net) has been met. The website is up and running at www.appletesters.net. This will assist growers in making their number one decision as to what variety to plant? In 2010 we will continue to populate the web-based database application at appletesters.net with additional records from multiple cooperators. The web interface will continue to be enhanced for ease of use and to garner the most information on sustainability of cultivars. Our goal for the 2010 growing season is to have the database be self-populating by our cooperators, including university and industry personnel and growers that will observe and record important horticultural characteristics including tree habit, bloom time, disease tolerance, mortality, precociousness, fruit appearance, taste, storability, and more. Current record results are available to all cooperators and growers so that they can see what variety characteristics are performing best in their area. 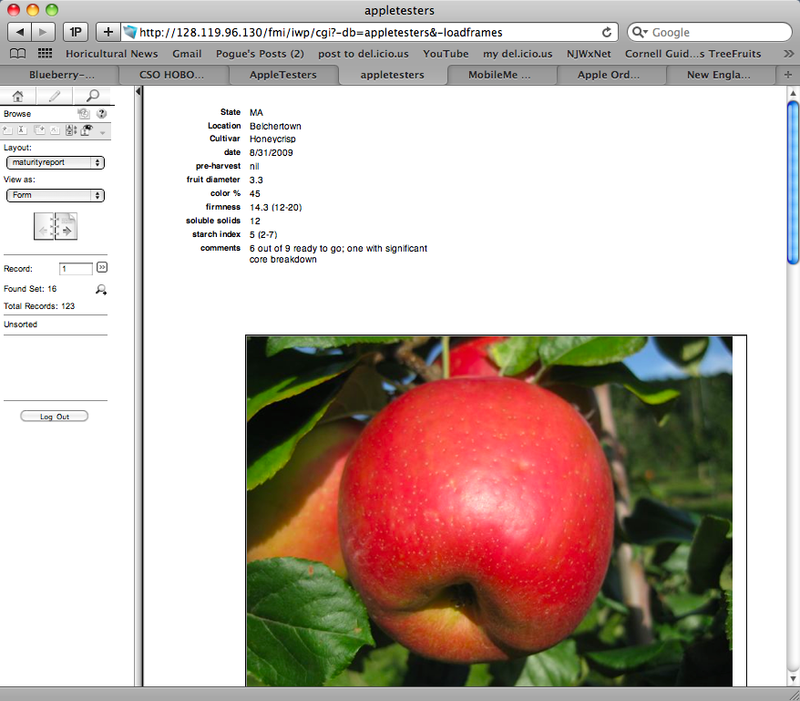 The database includes pictures and casual observations in addition to fruit quality measurements. A web home page for AppleTesters database was created in late summer 2009, www.appletesters.net (attachment 1). 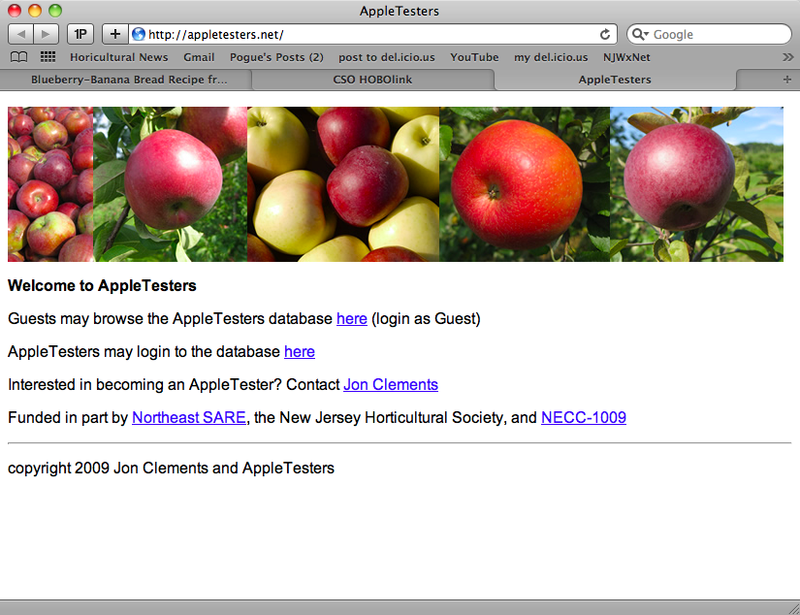 From the home page, links to guest or Registered AppleTester users take you to the actual AppleTester database. In addition there is a contact link and reference to the funding partners (Northeast SARE, NJ State Horticultural Society, and NECC-1009). The actual AppleTester database is hosted by Filemaker Server v.10.x (www.filemaker.com). Guest access via the web allows browsing, searching, and sorting of records. Registered AppleTester users (by username and password) can do all of the above plus create new, edit, and delete records. The database can also be accessed by Filemaker client software. 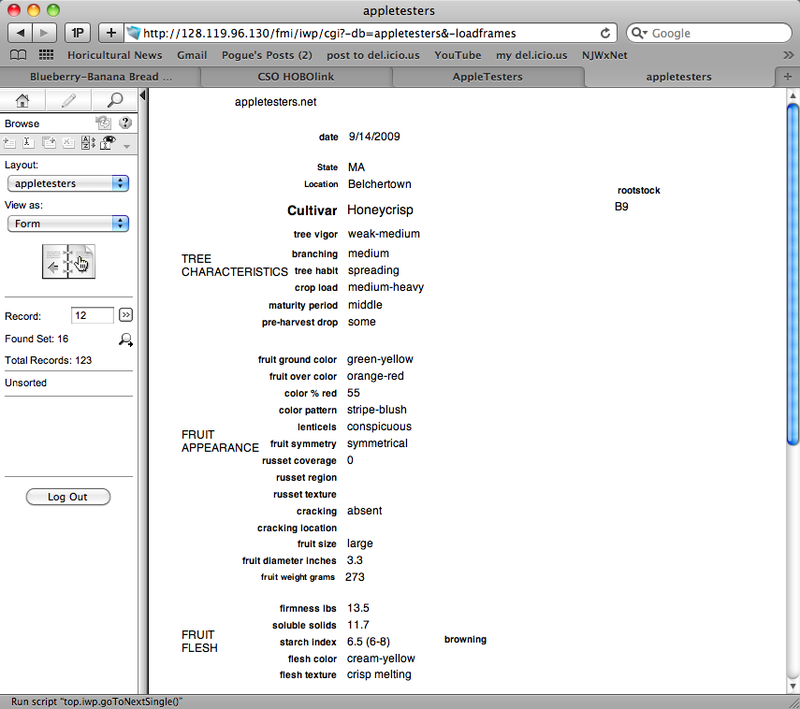 The database has several layouts which the user can choose: a complete record with Harvest Date, Location, Tree Characteristics, Fruit Appearance, Fruit Flesh, Fruit Flavor, and Overall Characteristics; a summary maturity report with Fruit Diameter, % Red Skin, Soluble Solids, and Starch Index; and a picture layout that includes pictures of the Fruit and Tree. (Pictures are uploaded to a separate site and referenced via hyperlink.) As of 11/24/2009 there were a total of 123 records in the database (individual apple variety evaluations, some from the same variety over different harvest dates), several scab-resistant cultivars such as Topaz are included. Links to AppleTesters from Virtual Orchard and UMass Fruit Advisor websites have been posted. AppleTester cooperators are being actively recruited for the 2010 growing season from New Jersey, Pennsylvania, New York, and Michigan. Research Horticultural Meeting and Fruit Variety Showcase – Rutgers Snyder Farm, sponsored by Rutgers Cooperative Extension in cooperation with NJ NOFA. September 16, 2009 – 38 growers attending. Over 100 trays of new apple and peach cultivars were on display. Presentation at the 2009 New England Vegetable & Fruit Conference, Manchester, NH, December 2009: ‘New, Antique, and Different Apples.’ Duane Greene and Jon Clements- 90 growers attended. Formation of eXtension RAVES ‘Rootstocks and Apple Varieties for the Eastern States’. Because of collaboration such as AppleTesters, a group of Eastern apple variety and rootstock scientists/Extension educators submitted and was funded in 2010 to develop an eXtension Community of Practice (CoP), ‘Rootstocks and Apple Varieties for the Eastern States’ (RAVES’. The CoP will be hosted on the eXtension website (eXtension.org) and developed/populated with apple variety and rootstock information aimed at commercial and enthusiast orchardists beginning in 2010 and continuing through 2012. It’s likely information submitted to AppleTesters will be included as part of the RAVES CoP.